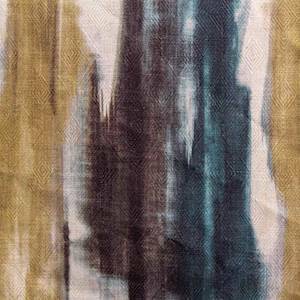 This drapery and pillow fabric features painted-look design in shades of dark teal blue, dark mustard yellow, and dark brown on a natural background. The streak design and colors give the fabric a southwestern look. This fabric would look great as drapery fabric or pillow fabric. The design is printed on a heavy linen-blend base cloth with a woven diamond design.